Triangle Management & Investment Inc. operates four Choice Hotels in Florida. The corporation wanted to implement a digital signage system that was inexpensive, flexible, would work with its existing in-house cable system and could be remotely managed. It found all of that and more with StrandVision. 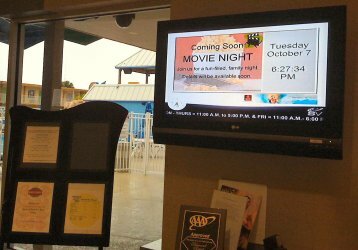 Now, the StrandVision Digital Signage system at the company’s Clarion Resort & WaterPark in Orlando is used in public areas and drives the in-room information channel. Results: Increased awareness and sales in its restaurants and for its attractions. Triangle Management faced a communications challenge: How could the Hollywood, FL management company economically and remotely manage digital signs at its four Fort Lauderdale and Orlando Choice properties? Explained Benny Fresco, Triangle Management Director of Technology, "I just wanted to find an easy solution that would be cost-effective to display meeting notices, advertise the hotel, display the weather and time, and have news feeds that I could manage remotely." Early research for alternatives was not encouraging. They looked into developing a looped PowerPoint presentation “but it was too convoluted.” All of the outside systems that the IT department considered required heavy investments in both hardware and software licenses. Benny Googled digital signage and found StrandVision. “What hooked me on StrandVision was reading about some of their vertical markets. What really got me hooked was when I tried the free sample and saw how it works on the Web. “It’s very straightforward. You pick the kind of slide. You add your information, save it, and activate it. And once you’ve activated it, that’s it. There’s no rebooting. There’s no disruption when you’re updating the sign. Your new slide will come in the next cycle -- you’re set to go. Benny installed the StrandVision Digital Signage system at one of the Orlando Clarion properties. A single feed serves 15 42-inch plasmas in the hotel and almost 200 guest rooms – all delivered over the facility’s house cable -- Channel 45. He pipes in background music and the hotel’s jingle to accompany the signage. Benny takes advantage of several StrandVision features, certainly the remote access feature. The Clarion Resort has also put the digital signage right into the sales process. When an event is scheduled, the sales administrator sends out the contract, reserves the room and posts the event to StrandVision. The adminstrator uses the schedules feature, which holds the slide until the event is near, automatically adds the page to the digital signage display at the right time and removes it when the event has passed. As for the future, Benny will be adding StrandVision Digital Signage in the Fort Lauderdale Quality Resort. It will be the same house cable setup, but here the signage will be used to display shuttle schedules for cruise ships and airport drop-offs since the hotel handles a lot of cruise/airport customers. That way guests can spend their time (and money) in the restaurants as they wait for their shuttles. Click here for the PDF version of this article.